Shortly after the landing at Inchon that promised to end the Korean War, a Marine platoon is sent to seize a farmhouse that blocks a critical pass. However, they march into an ambush, and the lieutenant lives long enough to order Sgt. 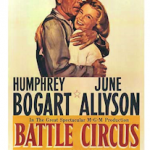 Towler (Sidney Poitier) to take charge, instead of the more experienced Private Kincaid (Alan Ladd), a former sergeant who had been demoted for insubordination, to the surprise of everyone, including Towler. Aware of his lack of experience, Towler admits to Kincaid that he needs help, and Kincaid gives some advice but resents being passed over. They capture the farmhouse, which is abandoned except for a woman named Maya (Ana Marie Lynch), her mother, and her son. Towler’s greatest critic is Private Bracken (Paul Richards), an openly racist Southerner, who is constantly rebellious. Dismissing Towler’s belief that the battalion will arrive in 48 hours, Kincaid wants to save the men and leave, but Towler insists on defending the farmhouse. The North Koreans launch major attacks each night, and are slaughtered both times, but the defenders are gradually whittled down. When a tank appears, Kincaid and Towler light the tank on fire with kerosene to smoke out the crew, enabling Kincaid to drop a grenade inside. Unfortunately, Kincaid is hurt, and more tanks arrive, forcing them to abandon the farmhouse. According to the opening narration, the story starts on October 11, 1950 as UN forces strike at Wonsan to repel the NKPA and Chinese communist aggression. It is true that following the landing at Inchon and the capture of Seoul, the Marines were sent to Wonsan, but the port had already been captured by ROK units. However, the harbor was mined, so the Marines waited at sea for days while the mines were cleared. In fact, the Marines were still at sea when Bob Hope flew in to entertain them, but the script focuses on the difficult process of desegregation in the army. President Harry Truman had issued an executive order integrating the American military in 1948, but it was not universally embraced. The deep-rooted racism is personified by Bracken and Kincaid, both of whom are racist, but Kincaid is genuinely concerned about the men, while Bracken can simply not accept the concept of a black man in charge of him. Following the cliches of small-unit war movies, Private Hunter (Mario Alcade), a member of the squad who is a Navajo, goes out scouting but gets captured. Unlike most movies about a small unit trapped by a much larger force, he was not trying to get help, just to scout the area, which seems pointless. Instead of sending out a scout during the day, they could have cut back the brush in front of the farmhouse to get a better field of fire, thus preventing the enemy from repeatedly sneaking up only a few feet away from the farmhouse. Like many small-unit films, the platoon is surprisingly diverse. Aside from the African-American Towler, Bracken is from the South, Private Torgil is Swedish, and enlisted to get his citizenship, Hunter is Navajo, and Corporal Crane is from a big city. The script spends little time on the larger issues of the war, but the soldiers’ contempt for the intelligence officers who promised no resistance is deservedly biting since it is three days before Christmas, and MacArthur had promised to send them home for Christmas. The battle scenes are great, and the cameras are positioned well to show the action clearly. Filmed in Oregon, there is lots of snow, so everyone on both sides are bundled up well, which enables the local Blackfoot extras to pass as NKPA. Determined to avoid the meek, subservient characters played by black actors in earlier films, Poitier is confrontational throughout the film. Towler convinces Bracken to dig a grave for the lieutenant by pointing a rifle at him. Kincaid is forced to abandon his attempt to abandon the mission and lead the men away from the farmhouse when Towler threatens to pull the pin on a grenade and kill them both. Later, they get into a fistfight that ends only when an enemy tank appears. The script was written for Sidney Poitier, but Columbia only agreed to finance the movie if there was a white co-star, so Alan Ladd joined the production as co-star and co-producer, which explains why so much of the film focuses on the relations between the two men. Furthermore, both men get to play the hero several times. After saving Kincaid’s life with a blood transfusion, Towler even carries out the wounded Kincaid himself when the house is shelled, instead of giving the job to a couple of soldiers who had not just donated several pints of blood. A scene where Kincaid helps a scared recruit get out of a minefield is good but is too long. To be fair, several supporting actors are given scenes during an interval when they relax at the farmhouse, but it resembles a variety show, not a war movie. Corporal Crane (Mort Sahl) does a comedy routine that looks like he should be sitting on a stool in front of an audience in a smoky bar, Private Cotten (played by teen idol James Darren) sings the movie’s theme song, and heavyweight boxing champion Ingemar Johansson has his screen debut as Private Torgil, and also sings a Swedish folk song. Maya, the half-Korean, half-French owner of the farmhouse, looks neither Korean nor French, unsurprisingly since she is Argentinian. Her presence in the film is likely due to the fact that she is the wife of the director. The scenes with her are horrible, and her character serves no purpose, other than to be nearly raped by Bracken. After Towler gives blood to Kincaid, Bracken sees him as a human being, so the movie ends with a positive message. Made during the period between the end of Jim Crow laws in the southern states and the race riots in the early 1960s, the film was a radical look at racism in the American army. 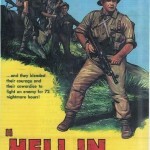 Unfortunately, aside from the theme of desegregation in the military, it is an average film. The action is good, the dynamic between Towler and Kincaid is good, but the scenes of the soldiers griping fall flat, the writing is tepid, and the secondary characters are mediocre. 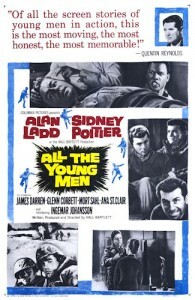 All the Young Men is a boring film that should be avoided by everyone except for Sidney Poitier and Alan Ladd fans. Thanks for doing so many Korean War films. I am really enjoying these reviews. I have not seen this one yet and have been reluctant to because of some reviews I have read in my war movie review books. Sounds like they are right. Is the big city character from Brooklyn? 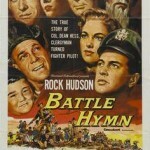 Glad you are enjoying the Korean War movies, I am getting burned out, fortunately I only have two more and I am done. It is good to do a lot at once but the lack of variety is a bit irritating. The movie is not horrible, and the performances by Poitier and Ladd are honestly good, but it is a message film, and not very subtle.